September is when many of my annual guests return and stay a minimum of a week or sometimes up to six weeks with a mini break to Europe in between. Bob and Feff from Australia have been returning for the past thirteen years and we have got to know them so well that we always include them in a few family suppers. They like to have the same room each year and I always like to spoil them by serving clotted cream at breakfast which I know is Feff’s guilty pleasure for the time she is here! They are such an interesting couple, they both lived here in London in the 1960s and owned a mini which they toured Europe in with several Aussie mates. Bob who is an Architect gave me so many ideas when I was redesigning my kitchen several years ago and it was he who talked me into buying a Quooker 10 years ago! So, a big thank you, as no one waits for a pot of tea anymore at Parklands! Mathias, he is another regular who has been coming for the past 19 years and he has overlapped with Bob and Feff for several years and his passion is the Fire Brigade. He has given me sound advice over the years, in regards to fire safety in my B&B. For him, his perfect breakfast is cornflakes with fruit followed by bacon and eggs – he has that each day and is never tempted by the patisserie that changes daily! I love serving breakfast and listening to their exchanges of conversation catching up on each other’s lives since their last meeting. It has been a busy month in the house socially as Chris my eldest son had invited his partner’s mother to come and stay (she lives in California) so most evenings we had a few drinks followed by supper and several of our guests joined in the merriment. The atmosphere became like my chalet girl days where I cooked supper in the evenings not only for the family but the guests too. It may seem unnecessary to do this but I prefer to include the guests even just for a drink because I am conscious of noise and not everyone sleeps like a log! Last Friday night was the first time I did a supper where guests who have become family friends all met. It was one of the best nights in the house, none of these people would have met each other in their normal course of life and I was the connection. Everyone got on, the conversation was lively and the age span was from 20 to 64. As I said to one of the guests, this age span only happens when families get together for a celebration or Christmas… and this is one of the main reasons why I love my job as I get to spend time with so many different age groups that I am always learning. Especially in these days of technology the art of conversation and engaging with someone other than family or friends is slowly becoming less and less common. 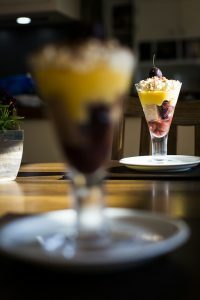 The most popular pudding I made over the past two weeks was good old English Trifle so I would like to share my recipe with you all. Cut the sponges in half and spread with strawberry jam and sandwich together and put in the bottom of the glass bowl. Drain the two tins of strawberries reserving the juice from one tin and add the sherry/port to the juice. Pour onto the sponges and let it soak in. When fully soaked put the strawberries and sliced bananas on top. Make the custard as per instructions – I always add a slosh of sherry or port to the custard and pour over the fruit and sponges. Once cool cover and put in the fridge. About an hour before serving, whip the cream and spread over the custard. Sprinkle the grated chocolate over the cream. Pop back into the fridge until ready to serve.